If I told you that I spent the morning with a handful of bleary-eyed students, the more cynical amongst our readers may assume that it was a case of them having to deal with the morning after the night before. Well, you’d be right, but not in the way you might think. The morning in question was spent down in Bath talking to the university’s Electric Formula Student Team about its inner workings and what they have been doing to make them the most successful Electric Formula Student team for the past two years. Far from recovering from the previous night’s Jaeger Bombs, one of the team hadn’t actually been to bed, having to juggle his time between his final year studies and his commitments to the Formula Student team; while another was still in the throes of recuperating from jet lag after having returned from a team event in China. Formula Student is the world’s largest student engineering competition, with over 600 universities taking part worldwide. The competition targets the development of enterprising and innovative young engineers and to encourage more young people to take up a career in engineering. Thanks to its strong links with industry, a large percentage of Bath University students take on industry placements as part of their studies, making Bath graduates some of the most employable in the country. A key part of this is Team Bath Racing Electric, an Electric Formula Student team based out of the university faculty of engineering and design. The format of the Formula Student events provide an opportunity for the students to test, demonstrate and improve their capabilities to deliver a complex and integrated product in the demanding environment of a motorsport competition. 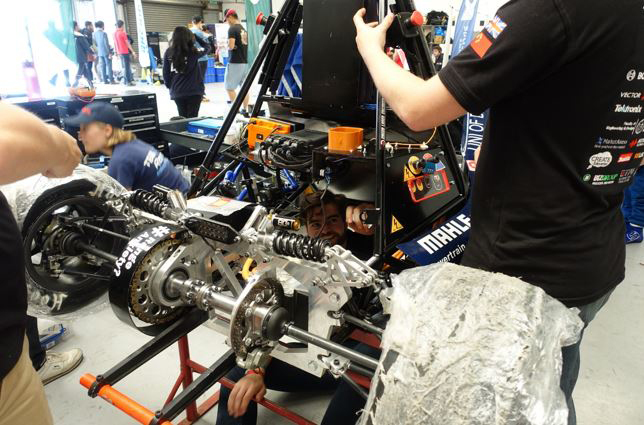 At Bath University the Formula Student project forms part of the degree and is viewed by the motorsport industry as the standard for engineering graduates to meet, transitioning them from university to the workplace. Each year the teams are challenged to design, manufacture, test and race a formula style racing car, and the Bath team have been the UK’s top Electric Formula Student team for the past two years. The team comprises students from all academic years studying engineering, computer science, and business, among other disciplines. The core team comprises primarily of final year students, who take the lead roles in delivering the car. The competition allows the students the opportunity to demonstrate their technical, engineering design, and manufacturing skills, as well as learn important lessons in team working, time management, project management, budgeting and presentation. Formula Student graduates also find that the professionalism they gain as practising engineers means they are well equipped for their future engineering careers. This is certainly something I noticed while talking to the team at Bath. The professionalism, dedication and passion for their work would echo that of any Formula One pit crew, and in truth the only factor that made the Bath lab stand out as a university were the fresh faces starring back at me. The team is tasked to produce a prototype for a single seat race car for autocross or sprint racing, and present it to a hypothetical manufacturing firm. The car must be low in cost, easy to maintain, and reliable, high performance in terms of its acceleration, braking, and handling qualities. During the competition the team must demonstrate the logic behind their proposal and must be able to demonstrate that it can support a viable business model for both parties, with every team going through a rigorous testing process. The teams are judged by experienced industry specialists across two events, static - which consists of design, cost and sustainability, and business presentation; technical and safety scrutineering; a tilt test and a brake a noise test; and dynamic - which features a figure of eight skidpan; sprint; acceleration; endurance; and fuel economy. The team at Bath University have come quite a long way in a short period of time. It formed with just nine members in 2015, when it received initial support from the university and produced a proof of concept vehicle. A year later the membership had nearly doubled, the racing team became an established part of the university and acquired a dedicated laboratory space, and it attended its first FSUK. Jumping forward to 2018 the team now has 60 members, were the most recent winners of the Class 2 competition, has retained the title of Top UK Electric Team, finishing all events at FSUK 2018, and has become the first UK team to attend FS China. The team’s success is driven by the desire to innovate and there is an emphasis on developing bespoke designs that ensure that the car is fully optimised for Formula Student racing conditions. Not only that, but this same philosophy provides the platform for the students to continue developing year-on-year. Shopland added: “We try to get first and second year students involved in any way we can, from as early as we can. There’s a year and a half development cycle per car. But we’re developing next year’s car when the current team are building theirs, so you learn lessons along the way. Since the team’s inception they have made several significant advancement in seven key areas of the car. Battery technology: Designing the battery from first principles in previous years has allowed the team to develop a wealth of knowledge in this area, from the characterisation of individual cells, to the design of battery wide safety systems. The challenge of tackling the complexities of cylindrical cell architectures was incorporated into the design of the TBRe18 (the team’s 2018 car). This was commended at FSUK and was used as exemplar material for other teams. Carbon fibre: Integrating electrical safety features into the manufacturing process of carbon fibre has allowed the team to fully realise the material’s potential. Research, combined with the production of test panels and scale chassis prototypes, has allowed the team to vastly improve its capabilities with carbon fibre. As a result, the TBRe19 hopes to provide a 20% mass reduction compared to the TBRe18 car, primarily through the light weighting of the chassis and battery. Driver environment: The continuous recording and analysis of diagnostic data in real time is essential for advanced vehicle performance. Bath’s custom interface enables the monitoring of important parameters, enabling fast, customised fault detection while ensuring a robust driver experience. Resistive touch technology lets the driver operate the system with gloves, providing an interactive live examination of the car, from which they can adjust their handling accordingly and deliver to their maximum racing potential. Sensors and telemetry: To aid vehicle tuning, Bath has designed an entire sensor network and wireless telemetry system. This will allow Bath to gather as much data as possible during testing and competition. This will be achieved by using technologies such as ZigBee and the development of an Android app to allow the live monitoring of data from the vehicle to the supporting team. Safety: The mixture of high voltage electronics and competitive racing makes safety the Bath team’s highest priority. Automated systems are in place to shut down the output from the high voltage battery under any fault conditions and dual modular redundancy ensures that the team has confidence in the electrical systems of the car. The driver is protected from impact and mechanical failures due to the team’s rigorous implementation of safety factors, professional manufacturing procedures and part testing. Motor control: With attention to a host of control tools, the team aims to unlock the full potential of its electric powertrain to deliver even more sustained power. Through the thorough characterisation of the motor the team can design and implement advanced, adaptive control to customise performance for the Formula Student competition. Techniques such as field weakening, regenerative braking and traction control will propel the car into modern competitive racing, ensuring the best results on the track. Vehicle dynamics: In racing, the optimisation of vehicle dynamics to extract valuable seconds in a car’s performance can be the key to victory. Bath’s vehicle dynamics model, developed from first principles and utilising industry leading software, will ensure customised set ups to suit the varying racing conditions of different Formula Student events. The bath team lists a number of key industry players as their sponsors, including Basingstoke-based, Newbury Innovation. Commenting on the company’s involvement with Team Bath Racing Electric, Technical Director, Jon Hawkins said: “Being involved with Team Bath Racing Electric brings undoubted benefits for both us and the student team. We get to work with some of the best young electrical engineers and learn with them, whilst they gain a far better understanding of what is really required in a commercial design and production environment. Supporting their personal development whilst watching them encounter and overcome real engineering challenges through the course of the programme is very rewarding. What direction will connected vehicles take this year?